Congratulations to Florence and Jamie Williams of Helena, Mont., on the birth of Benjamin Chesnut Williams on Thursday, July 12. Ben's stats are 8 pounds and a shade over 20 inches long. Florence is a former HCN staffer and intern who freelances out of Helena. Her most recent HCN article was "Plains sense"; it described how High Plains people now see the once-hated Buffalo Commons idea (HCN, 1/15/01: Plains sense). Jamie runs the Montana branch of The Nature Conservancy. Not to be outdone, HCN board member and former intern Caroline Byrd dropped by in early July to show off her new baby girl, Catherine Makena Edson, born May 17. Caroline is the San Miguel program director for The Nature Conservancy in Telluride, Colo. 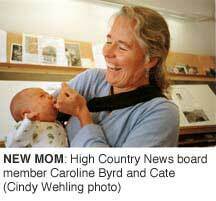 Her husband, Garry Edson, is a district ranger for the Uncompahgre National Forest. Anita and Drew Schwartz came by on their way home to Boulder from Telluride's Bluegrass Festival. Anita is development director for Environmental Defense in Boulder, and Drew runs Wall Technology in nearby Broomfield, Colo.
Santa Fe subscriber Courtney White, who runs a pro-ranching/pro-environmental group called the Quivira Coalition, came through Paonia on his way to the nearby West Elk Wilderness. He was studying an innovative group of local ranchers and how they make wilderness and grazing work together. Kimery Wiltshire, of Sausalito, Calif., and Lani Shaw of Aspen, Colo., had a busy few days in western Colorado. Kimery manages the William C. Kenney Watershed Protection Foundation as well as a group called Resources for Community Collaboration, which supports communities working to resolve natural-resource conflicts. Lani manages the General Service Foundation. A highlight was a trip underground into the Bowie Resources Coal Mine, but they also found time to visit the Black Canyon of Gunnison National Park, and to see staff from the Western Slope Environmental Resource Council, the North Fork River Improvement Association, High Country News and, across Kebler Pass in Crested Butte, the High Country Citizens Alliance. Former HCN intern Jim LeFevre dropped by the office in mid-June with an answer to a lingering question. A few days earlier, a late spring snowstorm had whitened the mountains around Paonia, and the next day, the town was crawling - flying, actually - with pewees. Pewees are small gray birds that usually hang out at much higher elevations than this, snatching insects in mid-air from perches in the aspen trees. We guessed the pewees had just headed down in search of warmer weather, but LeFevre figured they came to town in search of a meal - the storm probably wiped out the bugs they usually feast on. We'll take Jim's word for it. Since his internship in 1990, he's worked seasonally for the Forest Service doing surveys of forest birds. Jim brought a chunk of the LeFevre clan by the office. Bob and Cathy LeFevre (Jim's brother and sister-in-law) and their two sons, Greg and Kevin, were out for a visit from Lake Zurich, Ill. There, Cathy is a circulation clerk at the local library and Bob is a cabinetmaker. Reader Carl Safina says he enjoyed the article on salmon savior Ed Chaney, but added: "Any profile that doesn't mention Ed eating home fries and breakfast sausages is incomplete." Another reader of the story, Jerry Leone, manager of the Public Power Council, which represents 150 customer-owned utilities in the Northwest, wrote to tell us that she is most definitely a she, though we referred to her as a "he." Our apologies. As of this issue, HCN staffers Michelle Nijhuis and Rebecca Clarren have new positions. Michelle, the author of this issue's lead story, is now HCN's senior editor, and Rebecca is HCN's associate editor. Their consistent, hard work is much appreciated by the entire HCN staff.